From June 26 through July 14, you have been able to vote up to once a day for your favorite finalist in each category. 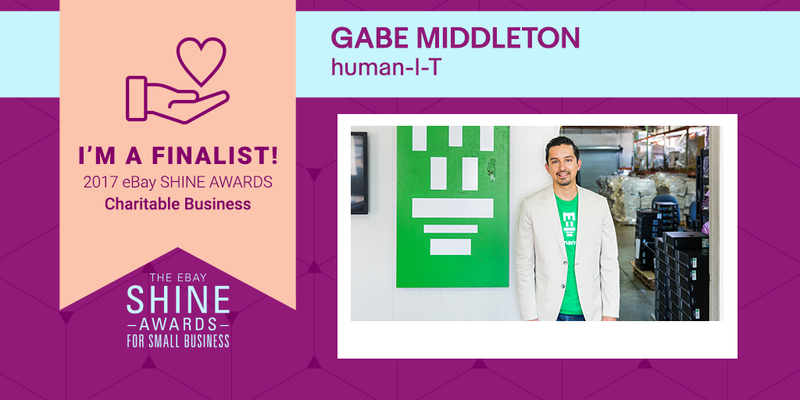 CEO Gabe Middleton talked about the importance of the awards to human-I-T in the following video. Please click the vote button below to help us win a chance at $10,000. eBay SHINE awards launched in May 2016 to recognize and celebrate the best and brightest in eBay selling community. The platform has been the cornerstone of human I-T’s growth and financial sustainability, which has helped human-I-T grow into an organization with a national presence. In 2012, with only a staff of two, human-I-T worked from an office the size of a storage closet. This year, human-I-T proudly celebrates that success, by being featured as 1 of 15 finalists (2,400 submissions) eBay SHINE Awards for the Charitable Business category. human-I-T now has three locations and a staff of 25 employees. Largely because of human-I-T’s success on eBay, we have provided free technology, bilingual digital literacy training, and Internet connections to 3,200 low-income individuals in Southern California and throughout the U.S. In order to provide these resources for free, we created a resale arm on eBay for all “outlier” technology - or technology that does not have use for a low-income family, to fund our operations. For example, corporations looking to get rid of technology may donate a server rack to human-I-T. By reusing and reselling that same server rack on eBay, human-I-T re-circulates the equipment back into the market and helps reduces the staggering levels of e-waste produced every year. human-I-T partners with entities like the University of Southern California (USC), and the City of Los Angeles to ensure their e-waste is being used for social good. eBay has helped human-I-T transform our vision into a full-scale reality. It fuels our fight to achieve digital equity and inclusion while continuing to promote the sustainable disposal of e-waste across the United States. The week of July 24, the winners (5 Category Winners and 1 Small Business of the year) will be announced at the 3 day eCommerce Conference, eBay Open in Las Vegas, with 15 finalists in attendance.As a Category Winner human-I-T could win a $5,000 cash prize, a 1-year Anchor store subscription, a $250 in eBay shipping supplies, $250 in promoted listing credits, a store banner makeover and a professional photo shoot and video profile.